Not even two weeks travelling together and we are already taking breaks from each other. Is not that we are getting tired, but when some chances happen you can’t just let them pass. It was obvious that Javi was going to need some rest, even if the hamstring on his leg was small. So after one day stopped in Toulouse we were already questioning ourselves about several what ifs. Luckily the Italian – Catalan family let us stay another night camped at their garden, so that was one worry less, at least for one more day. We cooked for them some pasta (or at least we bought the ingredients, because the father of the family explained us how to cook properly pasta), as a way of thanking their hospitality. During that day, that we spent relaxing, taking a short walk next to “du midi” channel and checking possibilities on the internet, I talked to my girlfriend. As Biziklautak had to stop, I proposed that she came visit, to be with me. Unfortunately the transport connections were not very good. But she has family in Saint Étienne, and it was easier to get there, so we agreed that we would meet there three days later. Only 400 km away, I knew I could do it in 3 days. I talked to Goiznabar and Javi, and they encouraged me to leave them, that it was a great chance for me, and that we could meet a few days later in Marseille. So I left, prepared to do the 400 km in three days. But in reality, I wanted to do it in only two days, both to see my girlfriend earlier, and prove myself I could do the distance faster. As a result I pushed myself to go faster, and it worked for half a day. I did over 80 before lunch time, and I visited Albi. But when I continued towards Rodez, city I wanted to leave behind before I camped, I started feeling really tired. Nothing really hurt; I simply could not keep going. It never happened to me before. Once I did 240 km in one day, crossing the Tatra Mountains. 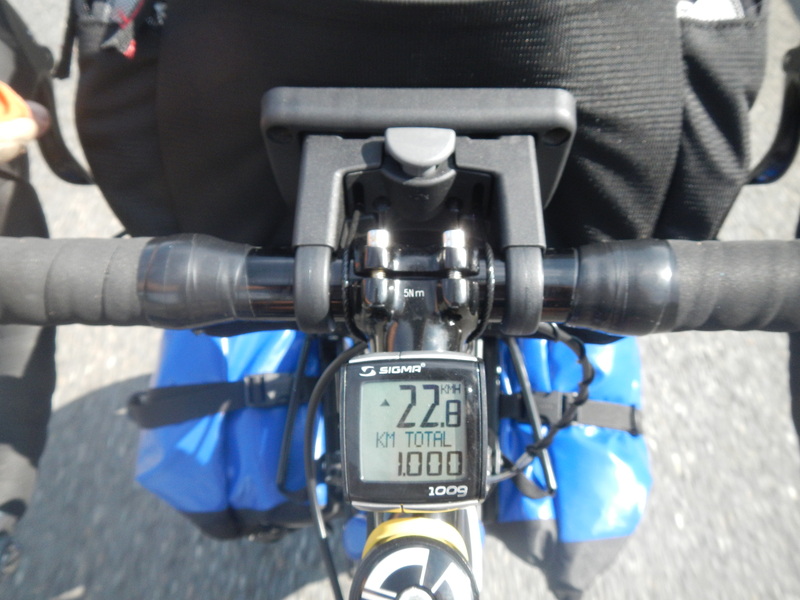 But that day 160 km were enough. It was clear that I was going to need 3 days. In Luc, 5 km from Rodez, I saw a couple sitting in front of their garden and I asked permission to camp there. They took me to their plantation field, and said that it was no problem if I camped there, so I did. It was a nice place, but that night I spent it thinking of my defeat. It’s true that I’m not as trained as I used to be, but still, it was devastating. The next morning I woke up early and got lost in Rodez. It seemed that every road out of the city was only for cars, and no bicycles were allowed. I finally found the right exit, and following the signs I realized that they were pointing towards ski stations. And the second stone of my way: I had to climb several mountains! They were not as long as San Martin, but I had to go longer uphill, and sometimes it was even steeper. Then I started doubting if I could do it in three days. Maybe I needed a forth one? About 50 km from Le Puy en Velay I found a nice place to camp, where I slept and lost my sun glasses. That night it was better, and I decided something. I was going to take the train from Le Puy to Saint Étienne. I was tired, it’s true, but I also wanted to arrive for lunch to my girlfriend’s family’s place. They were leaving the next morning and I wanted to meet them. Actually it was a great choice to take the train, I think. I could enjoy peacefully the ride next to the Loire, seeing all the castles along the way and the nice river. I’m sure that cycling I would have only focused on going fast, and not on the way. So no regrets there. Finally in Saint Étienne I met my girlfriend and her family. The next day they left, so it was nice spending lunch and the rest of the afternoon with them. I didn’t see much of the city, but as I knew I was going to be here at least for a week, I was not worried about that, I had lots of time to do so.